Most consumers of luxury products and services use them as status symbols – symbols of success. However, the definition of success – and the way it is perceived by others – is changing. Increasingly, consumers want the brands they use to address growing concerns that luxury products invariably come at a heavy social and environmental cost. The luxury industry faces its biggest challenge yet in satisfying an emerging demand of successful consumerism – products that meet high environmental, social and ethical standards.This collection sees internationally renowned fashion, luxury and sustainability experts come together to explore the challenges faced - and solutions developed - by luxury goods companies in sourcing, producing and marketing luxury products. 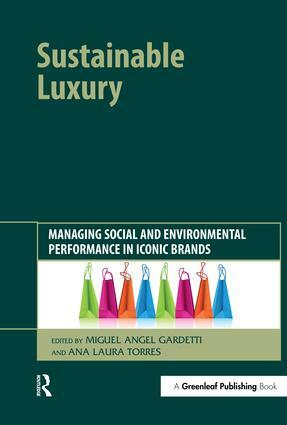 Sustainable Luxury: Managing Social and Environmental Performance in Iconic Brands represents the most comprehensive collection of current writing on the nascent relationship between sustainability and luxury. It will be essential reading for academics researching sustainable development in the fashion and luxury industries and it will provide invaluable guidance for practitioners seeking the latest research to help them meet consumer demand for sustainable goods and services.